Jiahui, who goes by Betty, has experienced a lot of “firsts” since arriving to the U.S. on the PSE program last August. There is American high school, which does not include school on Saturdays, allows students to join clubs and athletic teams, and involves a great deal of homework. There is also the culture of being independent. “All in all, both types of school life has its advantages. It is interesting to experience both. I have learned to become more independent and learn from the differences between America and my country. I have also learned to do stuff on my own,” she shares. Most notably, she has enjoyed celebrating holidays with her host family. Until arriving to the U.S., she had never experienced Christmas, Thanksgiving, nor Halloween. “The first time I experienced a real Christmas in the United States was fun. I learned this both from my host family and the Christmas movie we watched together. That was a fun time. We decorated the house and the Christmas tree. It was really fun and surprised me a lot after we finished the whole thing,” she reflects. Betty also had the opportunity to experience being part of a high school Dance Team for the first time. During the Christmas holiday, she and her Dance Team performed at a Festival of Trees in her town of Davenport, Iowa. Betty learned to dance in China for a school activity, and immediately took to it. 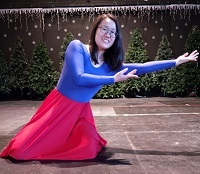 She learned the traditional dance of her province in China, and decided to share it with her Dance Team, peers, and host family by performing at the Christmas production held at her school. 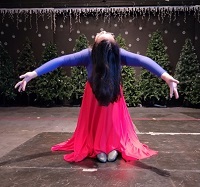 “I performed a traditional Chinese dance called Uygur at the Christmas Production. I like it because it shows my country’s culture and is a beautiful dance. This dance is the symbol of my province,” she shares. Betty’s host mother, Gina, shares her passion for dance. Gina runs a dance academy, and has enjoyed learning about traditional Chinese dance from Betty. She has found her experience hosting Betty to be wonderful, eye-opening and valuable. “Betty has a flamboyant zeal for life!” exclaims Gina. She goes on to describe Betty’s energy as being contagious and that she is so happy to share her culture with her and learn about the Chinese culture. 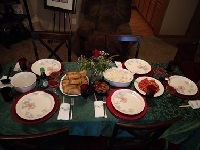 She was thrilled to celebrate Chinese New Year with Betty, and they prepared a special meal for the occasion. Of course, the experience has had its fair share of challenges, and Betty has become homesick at times. It has been a lot of work to constantly work on improving her English, however as she improves, her life in the U.S. becomes easier. All in all, Betty’s best memories thus far have been spending time with her host family playing games, celebrating holidays, watching movies, and visiting relatives. She also appreciates her Local Coordinator, who has been a great support to her and who organizes activities that Betty enjoys participating in. Betty will return for her senior year, then hopes to attend college in the U.S. and study design.